I received an e-ARC from the publisher in exchange for an honest review. This does not affect my opinion whatsoever nor was I compensated in any way. If words are magic, then Strange the Dreamer is the closest I've come to tasting it. 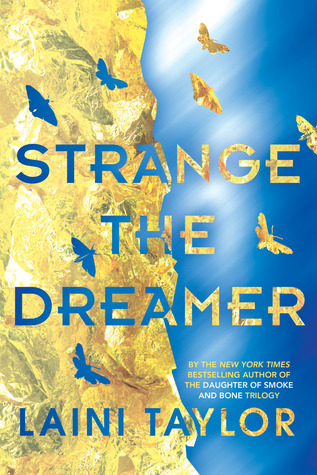 Strange the Dreamer is the tale of Lazlo Strange, an orphan who grew up in a monastery and escaped to the great Library of Zosma and became a librarian. He has dreamt of Weep, the mythical and magical lost city, his entire life and has chronicled everything he has come across in the massive library. When the Godslayer arrives at Zosma, he refuses to lose his opportunity to witness his life's dream. However, something happened 200 years ago that cut the city off, and all the answers lie in Weep. How do I express into words all the things that this book made me feel? Laini Taylor has a talent for painting worlds with her words. The world in Strange the Dreamer feels massive, without losing the imagery and the sheer wonder for the world that we see through Lazlo's eyes. It's beautiful and terrible and it feels so real. The novel shifts through different points of view of the characters within the novel seamlessly just like in her previous novels. However, this novel mainly focuses on the points of view of Lazlo and the mysterious blue-skinned goddess. It definitely helps since we are able to empathise with both sides and really understand the full situation. I have a lot of feelings for these characters. There were points where I didn't know where the plot was heading, especially as I found myself towards the end of the novel. How was this book going to resolve? I didn't care too much since I was so invested in the characters and the world. I was mildly concerned that the ending would be too rushed, but I didn't find it to be so. However, there is a literal "TO BE CONTINUED" at the end and I need book 2 now, because that ending. THAT ENDING. I'm not mentioning much about the story itself because I want you to discover the world and be as enamoured with it as I am as it unravelled in the novel. That, and I don't think I could do it justice with my words. Strange the Dreamer is a gorgeous fantasy novel with a vast world filled with love, treachery, a lost city and fallen gods. I already knew that I would love this novel and it has only exceeded my extraordinarily high expectations. If you're interested, and I hope you are, here's an excerpt from Strange the Dreamer: here. I now understand why this book is blue. I didn't know that this was going to be a trilogy/duology/whatever so this is good to know - I can properly prepare myself now. Thanks for the review Ri, I can't wait to own the pretty hardcover! This review made me so excited to have this book in my hands!!! I'm getting it soon so yay! And I agree Laini Taylor has a GIFT for gorgeous world-building.